I work a lot of hours in my home office. 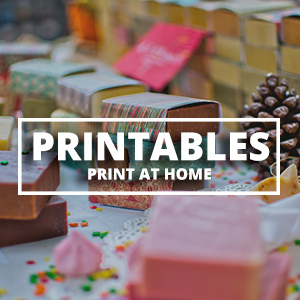 Between working on the computer and creating new sewing patterns and DIY projects, the office is the place I can most often be found during the day. Unfortunately, it wasn’t organized well. I had a great space and I didn’t want to be in it. You can get a glimpse of it on instagram, though I never photographed the super messy, overcrowded corners. I considered taking more “before” photos for dramatic effect but I couldn’t bring myself to even photograph it. But that doesn’t really matter because I love the finished product so much. 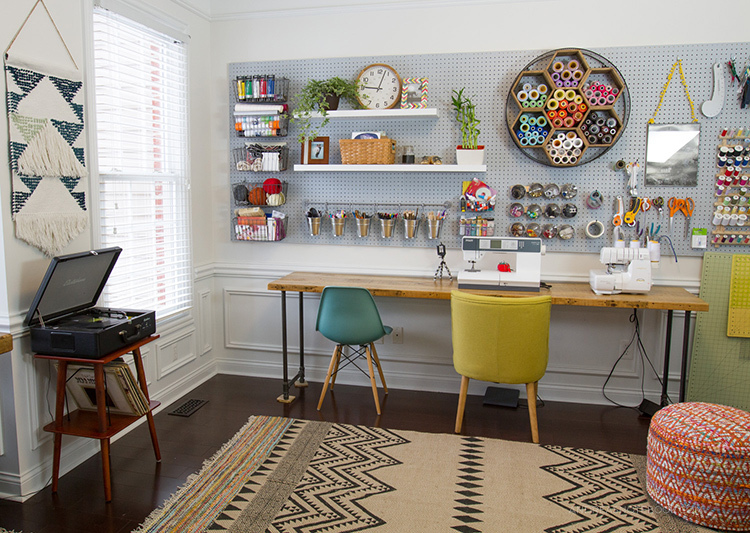 This creative home office is a craft room, sewing room, photography studio and computer work station all in one without being crowded. The pegboard isn’t new. I repainted it and reorganized the supplies on it. I couldn’t be more pleased. 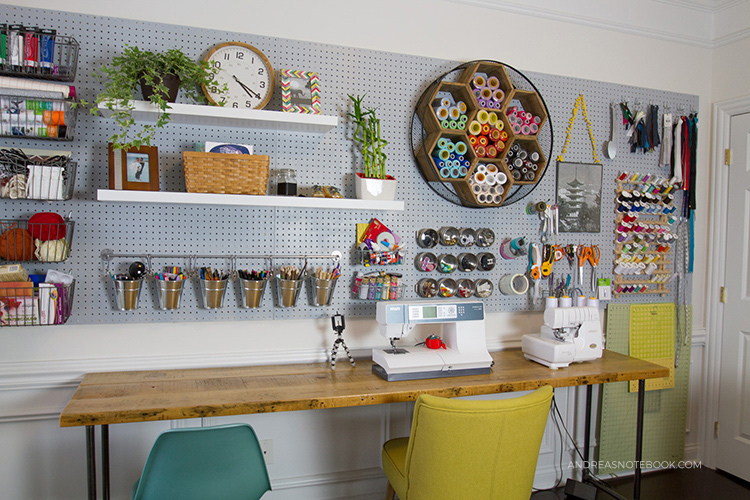 I had never fully taken advantage of both the aesthetic and organizational benefits of a pegboard. 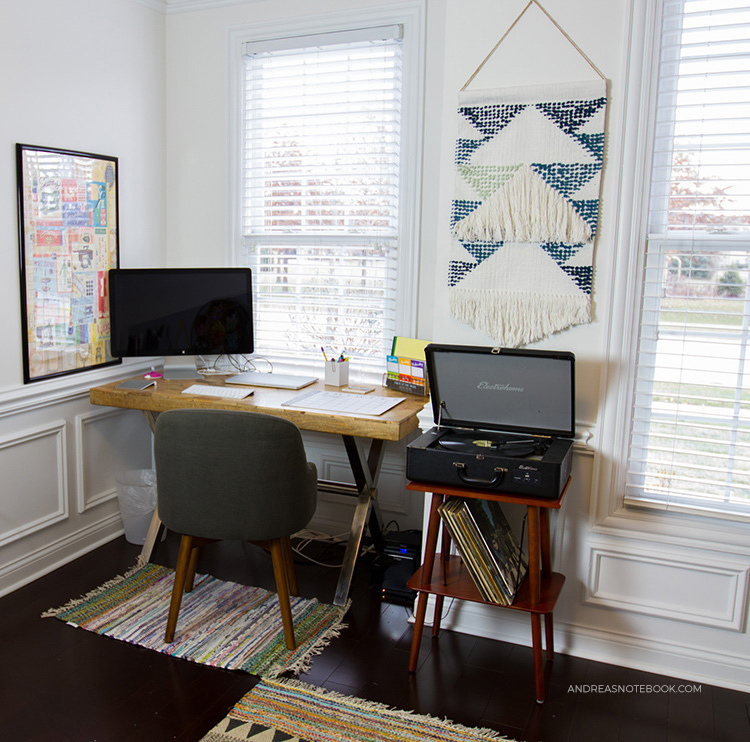 My new home office reveal is coinciding with Angie’s Craft Room Tours. 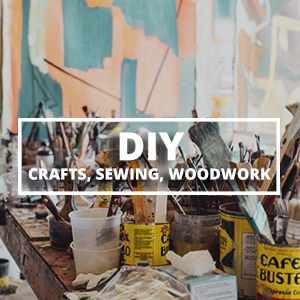 So if you’re looking for inspiration, make sure you check out all the great craft rooms. That little couch was in here before but was crowded next to a large cabinet that was full of non-work related supplies and storage. I removed that cabinet and it made me so happy. Having an office completely dedicated to my creative work helps me stay focused during the day. The pillows and floor pouf are from World Market, as is the rug and the bookshelf. 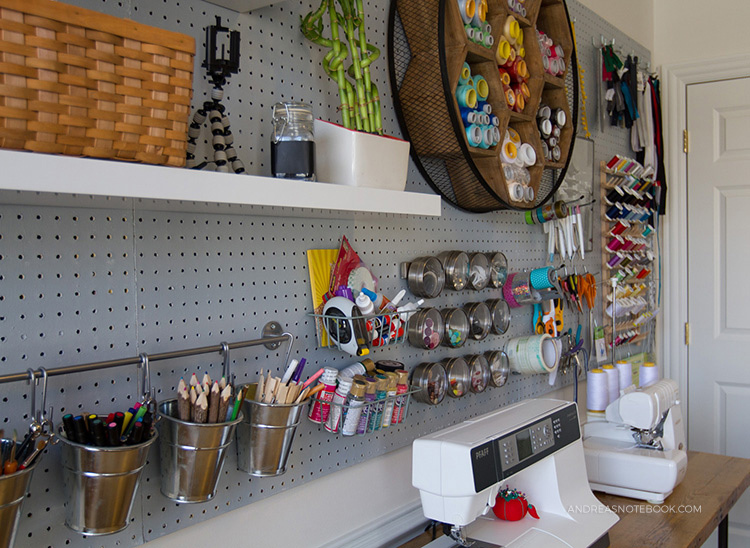 I use the shelf to store my photo props and additional sewing machines, office supplies and my Cricut. It’s a much more open and cheerful corner now. My desk is where I spend most of the day. I love facing out the window. I like to keep my desk pretty clutter free. Just my computer, screen, calendar, Days of The Week Sticky Notes and some pens. I’m one of those unfortunate cluttery people who hates clutter so keeping things off the desk is always a challenge but I do fairly well. 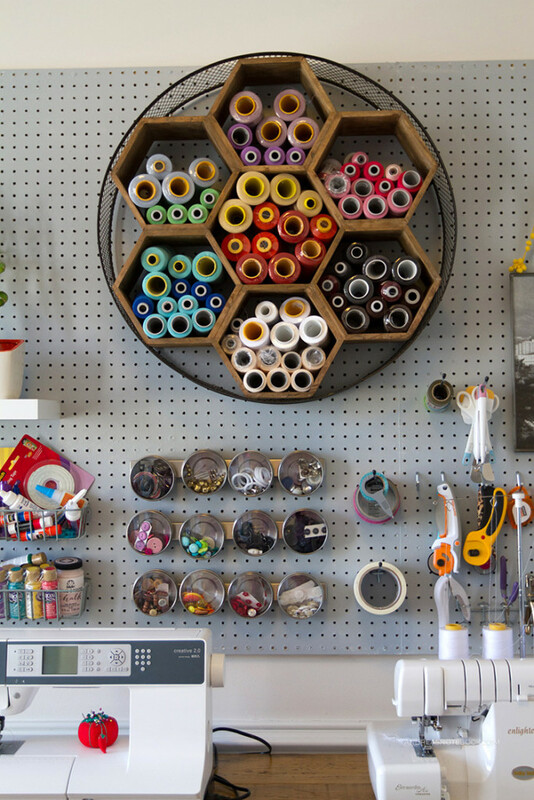 This honeycomb wall storage is my new favorite. 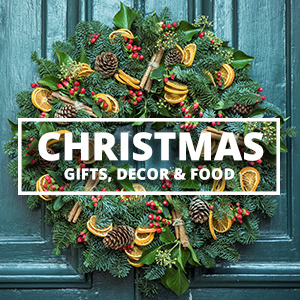 I got it at World Market as well. 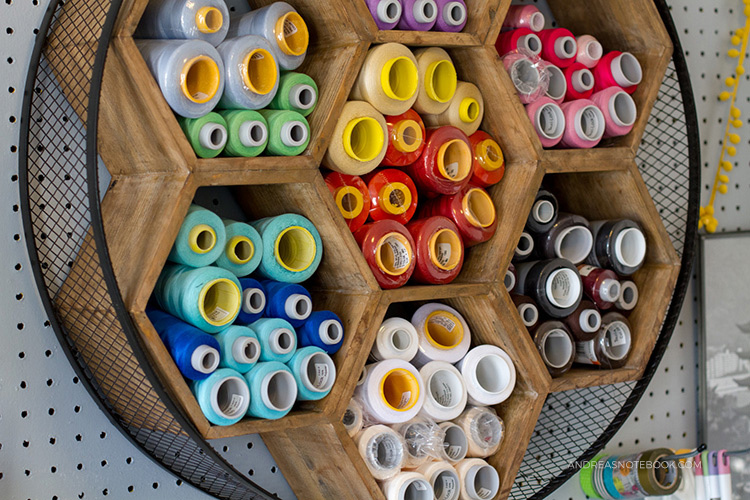 It just perfectly fits all my serger thread cones. I have just a few. 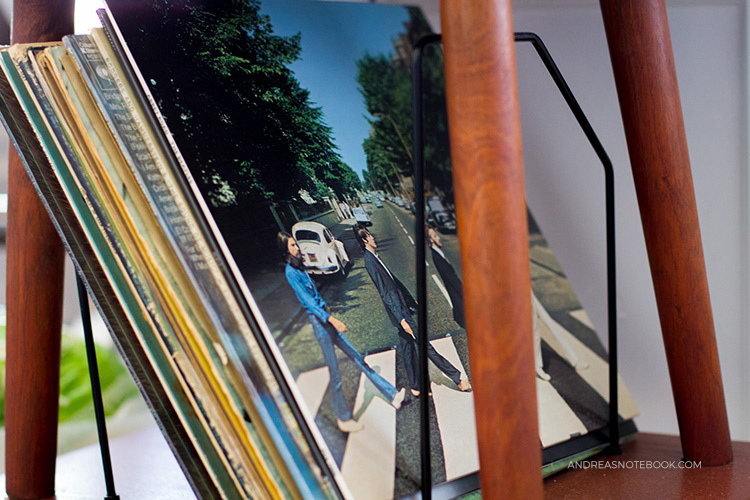 The record player keeps me company during the day. 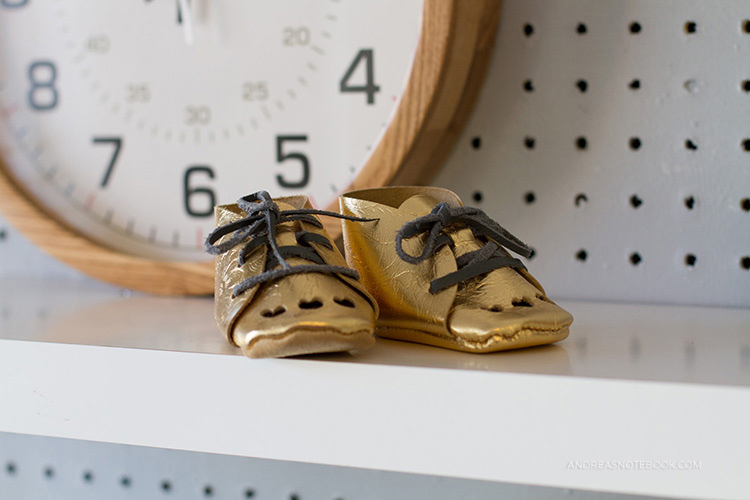 The gold baby booties. Since there are no more babies in our house I just keep these on the shelf to make me smile. 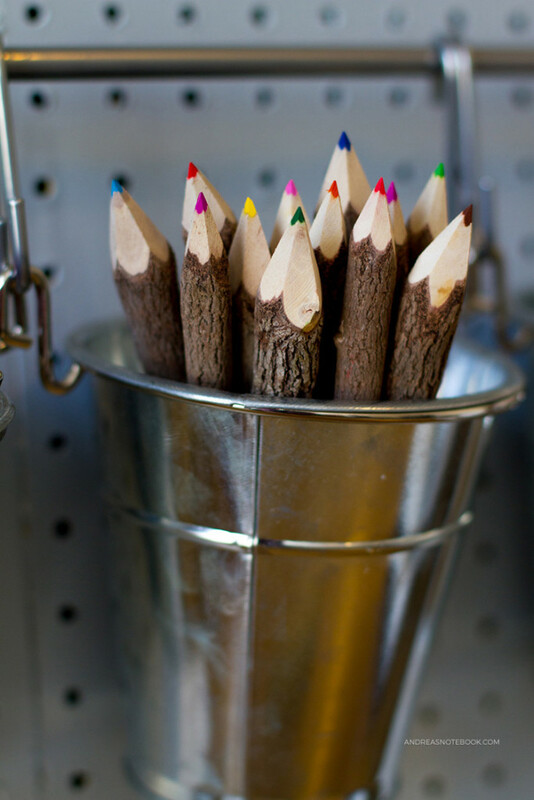 These Branch & Twig Assorted Colored Pencils were an impulse buy. They’re so fun though, how could I resist? 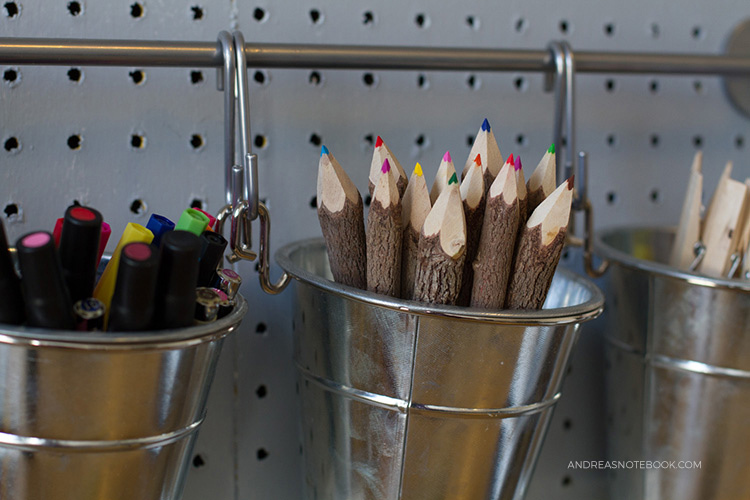 All my supplies at my fingertips. Paints, buttons, tape, thread, tools, scissors, glues, thread, zippers, yarn, string, and my GorillaPod smartphone tripod. Having live plants in an office makes a big difference. To me, anyway. The trick is to keep them alive! 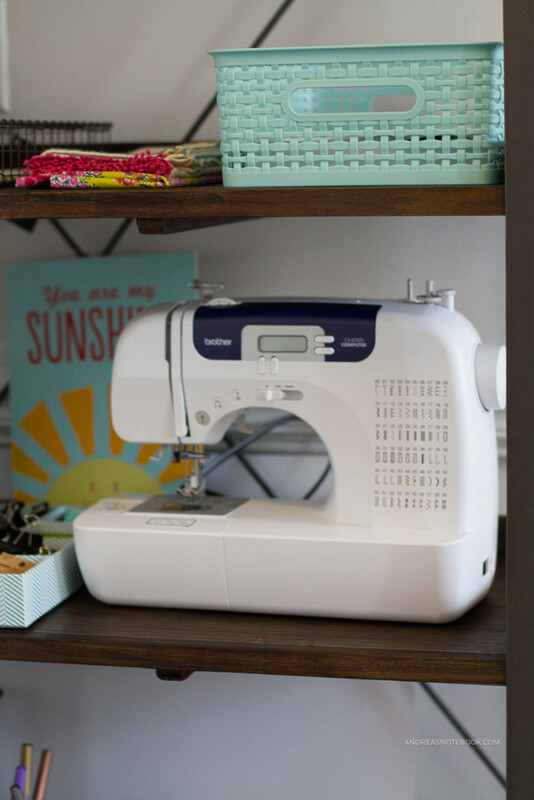 I have my sewing machine and serger on my desk and an open space for creating or for the kids to hang out and work with me. Behind that door is all my fabric. Ok, not all of it. There is a lot in the basement as well. It’s where I also hide my ironing board and my photo lights. 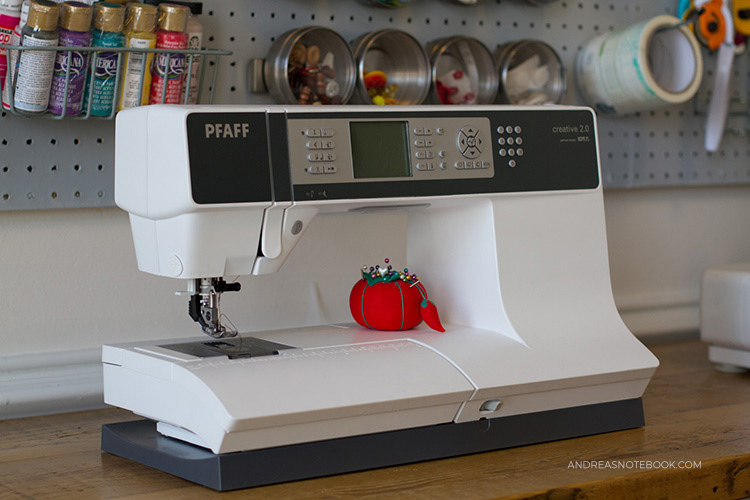 My main machine is a Pfaff Creative 2.0. I absolutely adore this machine. If you’ve never used one, the difference between this machine and a cheap machine is like the difference between cutting a watermelon with a dull knife and one of those super sharp knives that cuts through the rind like butter. 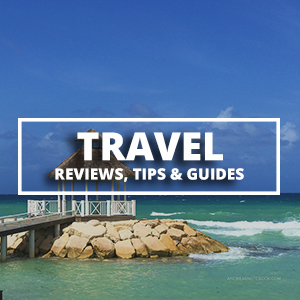 It’s super expensive, however, so I do have a great budget machine recommendation for you. Keep reading. My serger is the Babylock Enlighten. Run, don’t walk, to get one. 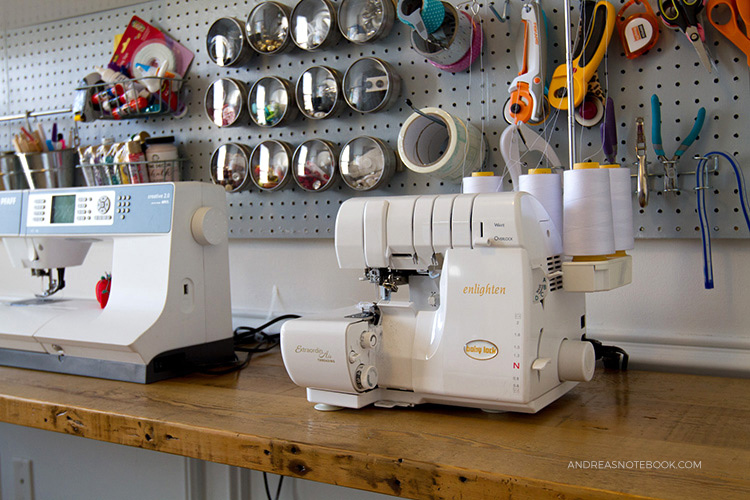 If you want a serger, or have a cheap serger then I suggest saving up for this one. I also have a Baby Lock cover stitch machine. I don’t use it as frequently so keeping it on this shelf makes it both accessible and out of the way. 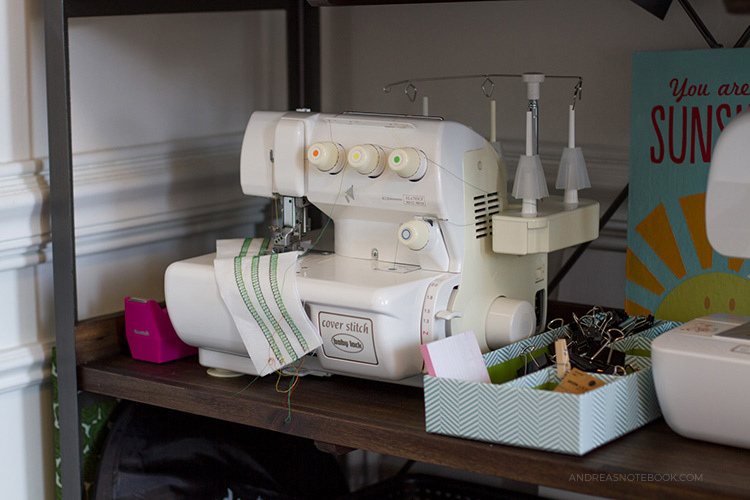 Back to my favorite budget sewing machine. The Brother CS6000i is ideal for newbies, kids and those on a budget. I wrote more about it here. The plastic woven bin is from See Jane Work. The magnetic spice containers that I keep my buttons in is from Ikea, along with the buck system. 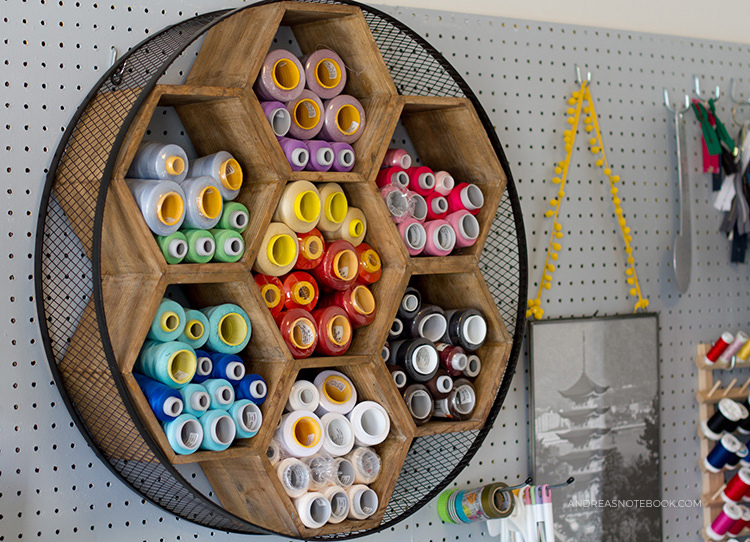 The thread rack is from JoAnn. 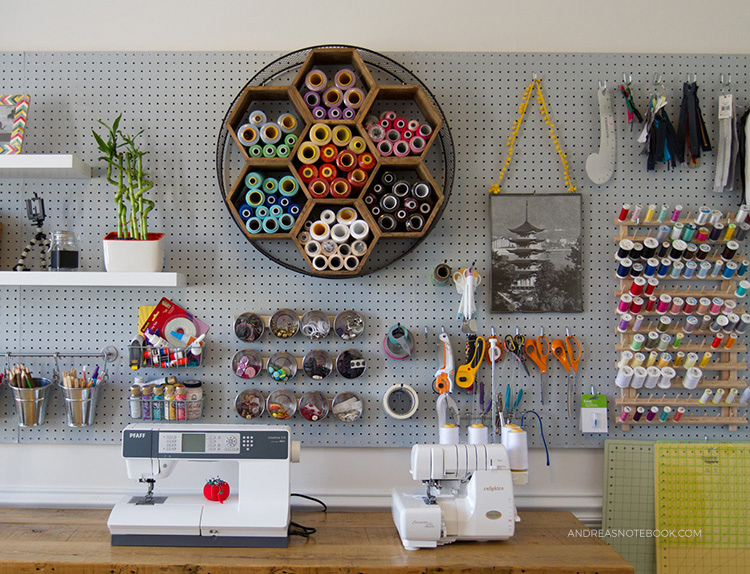 You can get a similar thread rack here. I hope you enjoyed the tour! 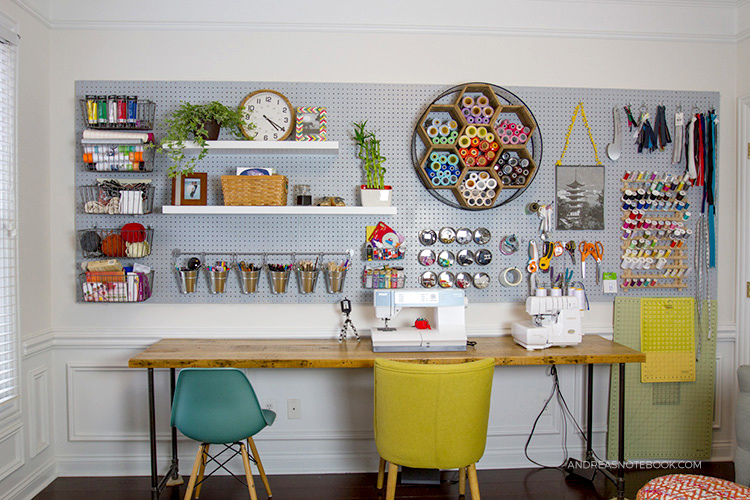 I’d love to hear about your home office/craft room if you have one! Hello guys if you love to watch the latest movies and tv shows live for free online then must visit my ink to watch and get free showbox app for free online. HEllo! 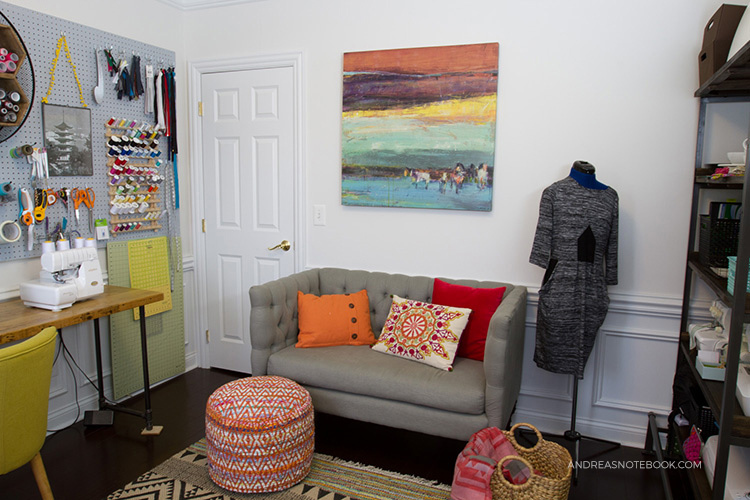 Where did you get your wooden top table with black legs…the one sitting under the peg board? Thank you! 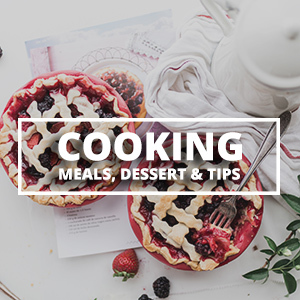 You motivate many people by sharing here innovative idea for how to organize large cabinet with was full of non-work related supplies and storage. I really enjoyed your blog regarding room tour.